You must make reservations at least 5 minutes in advance of the time at Twisted CUBAN Cafe & Bar. Live Salsa music & dancing every other Saturday night from 10pm - 2am. Our catering menu includes boxed lunches & buffet style dining. More details are available on our website or call us to discuss your individual needs and we'll provide you with a quote. The Twisted Cuban Café & Bar is a full service restaurant serving authentic Cuban food. Full bar service of wine, beer & cocktails including Cuban mojitos (the house specialty). The outdoor patio is a great place to relax & unwind. Live Cuban Salsa music & dancing every other Saturday! Bring Mom to enjoy Cuban food, drink & music this Mother's Day! Try something different for Easter this year & bring the family to enjoy Cuban food. My father is Cuban and did most of the cooking when I was a kid. 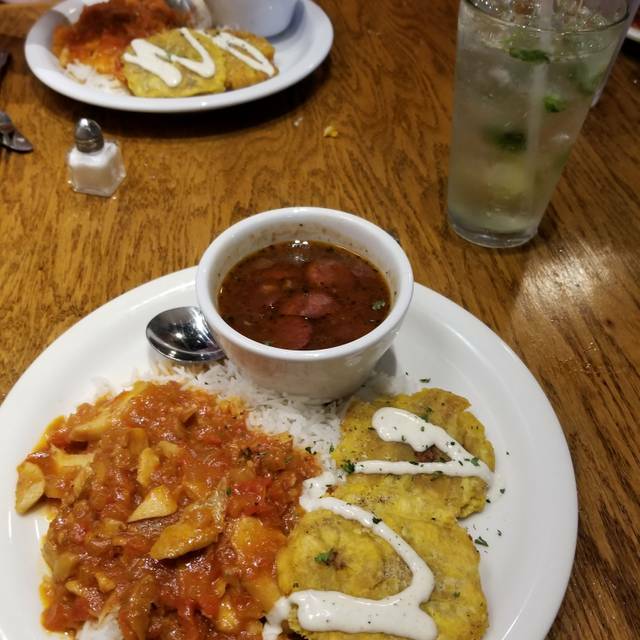 Cuban food is comfort food. This was an excellent twist ;) on my father's home cooking. The best flan I've had outside my family's! Very good meal, would of liked more heat (spice) in my dish. Will be back, good variety of dishes to pick from. Great food - great service - must try! This was my second visit and I was impressed again. I’m a huge fan! The food, service and experience were perfect. I’ll be back. The food and drinks were absolutely amazing! A little pricey, and the whole place smells like Cuban cigars, but it's totally worth it. Everything was going good until late at night the owner started to smoke a cigar inside the place . Yes .. a CIGAR!!! The music was more reagetton , trap , and banda ... only some salsa and cumbia. Unbelievable that guy was smoking inside , nobody said anything. It looks like he is used to do it !!! After taking my Wife on a date, I returned with my Kids as they had never had Cuban cuisine either. It is unanimous; we all enjoyed the Twisted Cuban. I especially like the cubanos and their Mojito! The waiter was an older gentleman he was “pesado” I’m sure he meant well but was very grumpy without meaning to be?! It felt very rushed and just a poor customer service experience. The food was mediocre. The ropa vieja looked more like tiki masala the dish itself was missing some bread type side to absorb the amount of sauce. I still left double the tax for a tip. Because while I will probably never return. I 100% support any Latin American restaurant that isn’t your neighborhood Mexican played out restaurant. I will say they did swap out my side of tostones for maduros. I did appreciate that. The food was great, the service was good. I definitely plan a trip back! I wanted to take my Wife somewhere fun and new to use; Twisted Cuban was exactly what we needed. Our waitress was very personable and quick with out order. We started with a Mojito and iced tea, fried green plantain, a twisted Cubano and the fried fish, black bean soup, and Cuban coffee afterwards. Everything was delicious, and I suggested that we bring the Kids with us next time. Very loud atmosphere, but also very fun. Delicious food and cocktails! Have eaten here many times over the years. Owned and run by Cubans so the food is authentic. Great food at a good value. Service was a combination of excellent from one person and young/slightly disinterested (at least that’s how it felt) from the other. Neat little place—nothing fancy, but unique and clean with cool pictures and souvenirs on the walls. Delightful flavor combinations, creative dishes, and really good desserts. Pretty quiet in the early evening, but probably not later, especially on salsa dance nights. Awesome food, service and music! The food was good, but nothing special. Four of us went during Seattle Restaurant Week. I wouldn't want to pay normal menu prices for what we had. We really enjoyed the Ropa Vieja (shredded beef) that has a really good flavor. We found out that one of the interesting ingredients that they use in a number of their entrees is bitter orange (extract). I love their desserts. One is fried plaintains with vanilla ice cream that is wonderful. The flan is better than the normal flan - richer and almost cheesecake like. Both are amazing! Love the food, especially the fish and roasted pork. And the flan was fantastic! Tasty mojitos and fun music. Excellent food..everything was fresh, tasty and serving portions were perfect. Service was friendly and prompt. Drink is were nice. Definitely a fun place to visit often. I had the Lechon Asada. It was amazing. My friend had the traditional cuban sandwich and loved that. All in all, it was excellent. For some reason their wifi wasn't working that day, but that didn't take away at all from an excellent lunch. Looks like "a hole in the wall", but, cute inside, delicious food and drinks, great service, reasonably priced. Great find for us in Woodinville. Will go back soon! The food was excellent - we would definitely come back there before we'd go to a concert at Chateau Ste Michelle. Our waitperson was excellent, ambiance great, and the food was beyond our expectations. Our only complaint is that the restaurant is located in Woodenville and we live in Seattle, or we’d eat there more often! Co-workers told me good things about Twisted Cuban ahead of time, so expectations were high. The restaurant met those lofty expectations. We ordered their specialty drinks and they were so good we each had 2. We played dominos (on the table) during the short wait for corn fritters appetizer. Yummy! I had a pork entree and my spouse a shrimp entree. We shared dishes and they were both great. Very authentic restaurant...... the food, the music, and ambiance. and they have a large selection ( menu says 4000) of cuban cigars! Good Cuban food. Slightly disappointed that the ceviche that was available during restaurant week was not on the menu (and the guava shells on the dessert menu were different than during restaurant week also). Service was friendly and started out well-paced but slowed a bit when a large party of bicyclists arrived (noise level increased as well). Delicious! We come here often and always enjoy the food. I never have written a bad review before but I cant go without commentary. The waiter was so short and rude. No people skills at all. I am Cuban and I ordered lechon and I got a shredded pork cooked in a red sauce. Thats not lechon. The amt of rice given is next to nothing. The black beans were like water. I ordered maduros and only three of them on plate were actually edible. The cuban coffee was awful. We were never asked once if we wanted a refill on our drinks. We spent 152.00 because it was a special occasion and being able to treat american friends meant a lot to us but we will not be coming back. We had a lovely time and great food. It was a beautiful afternoon, not crowded and sweet personal service. All the food was exactly how I had hoped-traditional delicious Cuban food. Definitely recommend! Really amazing and authentic food. I will definitely be back. The kitchen was very slow though, and it took about an hour to get our food. Food was ok. Neat place with a cool vibe. Food took forever to arrive. Wait staff was ok. We were a bit disappointed, but it wasn't a complete loss. It isn't authentic Cuban Food. Not even close. The taste is more of Mexican Food than anything else. Wouldn't recommend if what you are looking for is Cuban Food. Great food, good service and good atmosphere. Will definitely be back. We had high hopes for this place, never having been there before. It small, quaint, and very clean. Fill it up, and it’s noisy. The food was average, with not as much Cuban flair as we were hoping. The brown rice was quite salty, the black bean soup seemed out of a can, while the pulled pork was pretty good. Perhaps other entrees might be different. Desert was very nice, a flan and a rum chocolate cake. I don’t think the value was there, at least for the Seattle Resturant Week dinner menu anyway. Tasty Cuban staples in a rustic cheerful atmosphere. Got the appetizer plate to share- all very bland. Posole soup not a big hit, nor were the Cuban sandwiches. Kind of disappointed, but maybe was expecting too much. It was great from the moment we walked in. Great food great service. Will be back! The menu for Restaurant Week (3 courses for $33) also included a free cocktail. The waitperson was overwhelmed by the dinner crowd; I had to explain I wanted another cocktail as well as a free one, and she couldn't split the bill 3 ways for 4 people. The Cuban food and drinks were excellent, with good portions. Fantastic desserts. Plain ambiance (like a roadhouse diner) but overall, the good food was worth it!